I love a nice candle all year round but especially at Christmas - there is something so comforting about a night in front of the fire with the twinkling lights on the Christmas tree and a candle burning that makes this time of year so cosy! 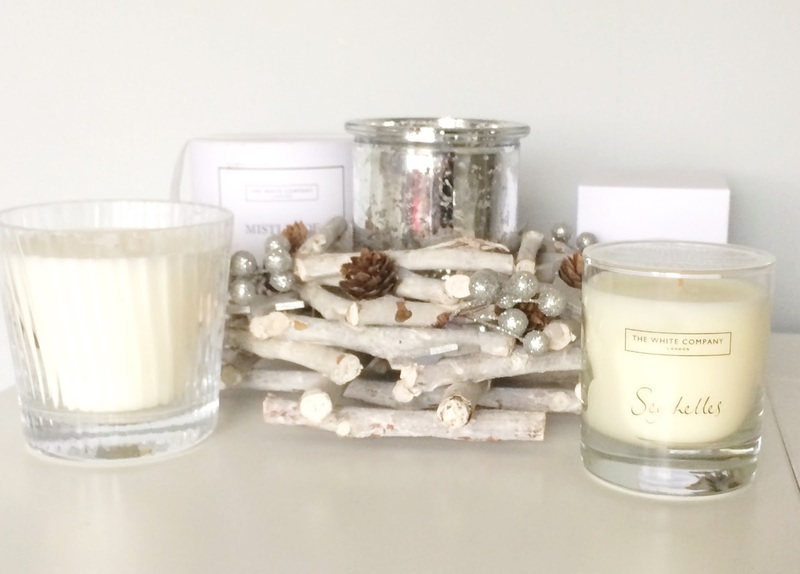 I think a candle makes a perfect Christmas gift and today I want to share with you two of my recent candle purchases from The White Company and also let you know the 20% discount code that I used so that you can too! I absolutely love The White Company candles because the scents always fill the room, even before they are lit. This is not sponsored - I paid for the candles myself but you know that I always like to share discounts where I can find them and we could all do with making savings at this time of year! Every Christmas, The White Company releases a range of Christmas candles and this year I chose the Mistletoe scent because I don't like anything cinnamon or clove scented, which most Christmas candles are. The scent is described as "Bursting with notes of aromatic spruce, woody cedar, sweet muguet and rich amber" and I would say that it is quite masculine in scent because it really reminds me of a man's aftershave - fresh, yet woody but not at all spicy. The glass jar is ribbed, which I believe is limited edition for their Christmas candles and it is 210g in weight, giving an approximate burn time of 45 hours. It is housed in a white drum with a silver ribbon, which works well if you don't want to wrap (as long as it doesn't arrive grubby like mine did). At £34, it certainly isn't the cheapest Christmas candle but I used the code AN951 to receive a 20% discount & free UK shipping (for Irish readers, I used the Parcel Motel). I think that this would make a lovely gift or even a treat for yourself and your home at Christmas! The second candle that I bought is Seychelles, which is part of their permanent line. I have wanted to try this for quite a while because the description sounded right up my street - Evoking the balmy breeze of an Indian Ocean island, soothing Seychelles combines notes of fresh bergamot, bright orange and rich amber with warming notes of exotic coconut, vanilla and almond. I love how warm, yet not sickly-sweet this fragrance is & I will probably keep this for the new year as I have a few Christmas candles to get through first but I can see myself repurchasing this one. This comes in a glass tumbler and is 140g in weight, giving an approximate burn time of 28 hours. It is priced at £20 and again, I used the 20% discount code to reduce it to £16. If neither of these scents sound like your cup of tea, then fear not because they have 28 different fragrances in total so you are bound to find something you love. The two codes that I have found are AN951 and AN701, both of which are valid on full-priced items only with free UK delivery and until December 23rd. If you are outside the UK, they are currently offering free delivery on orders over £50 and you must order by midnight December 11th. Like I said earlier, I am not sponsored but like to share discounts when I find them! I'd love to hear if you are a fan of candles or if you are buying any candles as gifts this year? What is your favourite type of scent? Also, I'd love to hear any other candle recommendations you have from either The White Company or Christmas candles, in general? Please tell me in the comments below!